High nutritious feed accelerating the growth rate of tropical fish and gold fish. This product is available in Amazon.in, Flipkart, Ebay, Snapdeal. At amazon.in you can purchase Taiyo Aini Fast Red Fish Food, 330gm(Free 33g -*Only For Limited Stocks) for only Rs. 120, which is 40% less than the cost in Ebay (Rs. 199). 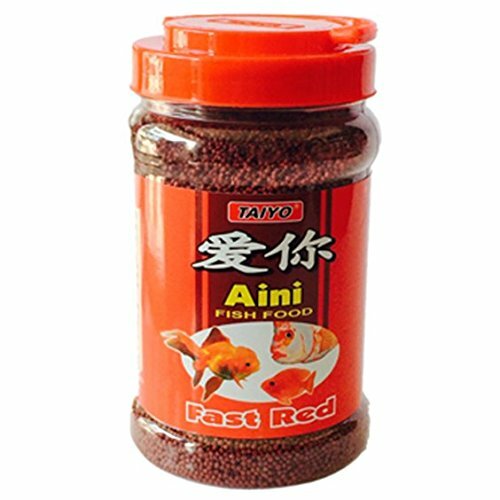 The lowest price of Taiyo Aini Fast Red Fish Food, 330gm was obtained on April 23, 2019 4:39 am. White fish Meal, Soyabeen Meals, Rice bran, Wheat Flour, Corn Meal, Vegetable Protien Extract, Lecithin, Vegetable oil, Vitamin A, C, E and important minerals other trace elements. Feed 3 to 4 times daily but in small quantity which can be eaten in approximate 2-3 minutes. Nice Product with in one Week my fishes are got in Good Color. received old and expired item.. my oscar died after eating this food..
this rating by me but i am sure my fish also rate same as me because they eat only first day after that they never eat this food, not feel smell on food like i smell other food i use for my fish, just smell like chai ki patti …… 🙂 i have OSCAR fish which is around 10 inch. Good product from Taiyo but i found that pallet size is not little large for Goldfish to consume. To fix this problem, I have started crushing the pallets into small chunks before giving it to my goldfishes & they seem to love it. I wish if there is an option to choose small pallet size. But overall, Good product & reasonable price !! Fishes not eating at all and moreover it’s forming like a layer in water And my aquarium filled with red color. Well here is my true review about this product after using it for 6 months for my Oranda Goldfishes.A-This product claims to enrich red color in goldfish.My results-1-Food(pellet) type- Floating type food.2-Pellet size-Little bigger not suitable for small sized fishes (8/10)3-Smell- little smelly similar smell of tealeaves. (5/10)4- Color enrichment in Fish-A very little red color enrichment in fishes after a long use. (3/10)5-Does it clouds the water?- Yes! it gives a horrible red color to tank’s water & Your Filter & tank is gonna messy with full of red substances. (10/10)6-Fish Growth- A little growth has been observed in 6 months. (5/10)7-Does it have any intoxicating effect on fish- Well none of my fish died or got sick after this product consumption. (0/10)Final Result(Satisfaction)- I am sorry to say that this product didn’t meet to my expectations. I bought it for especially color enrichment in my Goldfishes but it didn’t work well. Instead of it it caused my tank & filter to look very very messy with red substances. In my opinion if you love your beloved fishes ao don’t go for this crap product. Go for some highly nutritional fish food(even if it is costly) especially sinking type fish food as it is healthy for fishes& fishes swim bladder both. I have just switched from Taiyo to Hikari after researching a lot on fish foods. I’ll update my Reviews on Hikari Fish food after few months.Thanks.